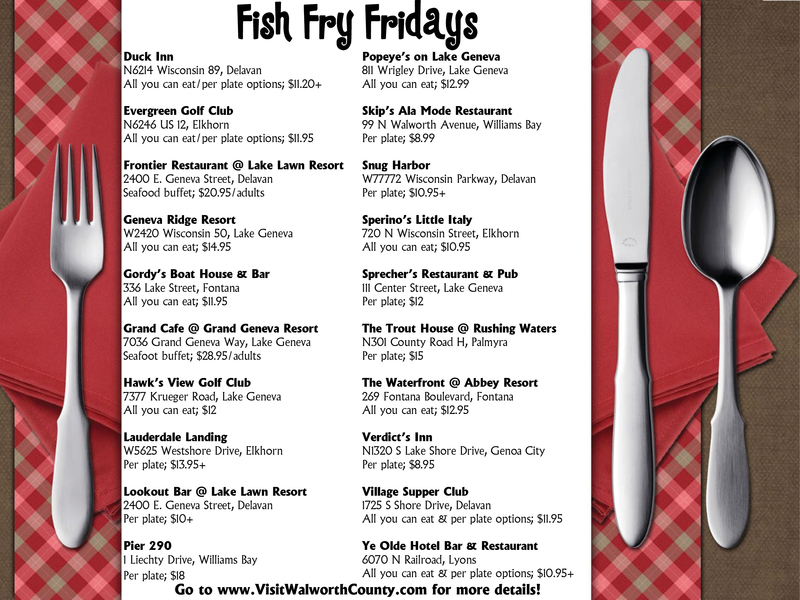 Each Friday during the 2014 Lenten Season, we feature restaurants in the Lake Geneva area offering a Fish Fry. Nothing screams Friday in Wisconsin more than a good old-fashioned fish fry. In Walworth County, we are bursting with amazing restaurants that offer a great fish fry. On that note, we’ve done our best to gather all of the great fish fry locations into one handy location for you, right here. What’s Included: Your choice of potato pancakes, French fries, sour cream and chive fries, sweet potato fries, homemade ranch chips, vegetable blend, or baked potato. Coleslaw, rye bread and lemon. What’s Included: The menu changes weekly – but includes an assortment of dishes…mashed potato/rice/pasta, hot vegetables, cold salad, chocolate fountain, plated desserts, etc. What’s Included: coleslaw, tartar sauce and choice of side – plus a draft beer or Old Fashioned! What’s Included: Cod meals include 3 pieces of cod plus choice of pub chips, fries, hush puppies, or onion rings ($1 more) or cheese curds ($3 more). Fried catfish meal includes choice of pub chips, fries, hush puppies, or onion rings ($1 more) or cheese curds ($3 more). What’s Included: applesauce, traditional potato pancakes, rye bread, tartar sauce – all accompaniments are house made in our own kitchen, using locally sourced ingredients whenever possible. For other fabulous dining options in the Lake Geneva area, visit our website, call us at 800.395.8687, or stop by the Visitors Bureau at 2375 East Geneva Street in Delavan – right across from the Lake Lawn Resort. Join us every week this Lent as we feature local restaurants in a mini-series on our blog called “Fish Fry Fridays.” Walworth County is full of great places to eat – some you’ve heard of and some you haven’t! If you have a place you’d like us to feature, comment below or give us a call at (262) 728-6000. This week’s Fish Fry Friday (our FINAL week!) takes us to six awesome locations in Walworth County – Hawk’s View Golf Club (Lake Geneva), Evergreen Golf Club (Elkhorn), The Trout House (Palmyra), The Village Supper Club (Delavan), The Waterfront at The Abbey (Fontana), and Ye Olde Hotel Bar & Restaurant (Lyons). Visit any of these local restaurants for a superb fish fry tonight! What does your fish fry include & what’s the cost? They serve a delicious Icelandic cod (baked, beer battered, or lightly breaded & fried, accompanied by homemade potato pancakes, corn fritters, or french fries, coleslaw, applesauce, rolls and butter – for $14.95. Add one or more Jumbo Shrimp for just $.95 each! What’s your hours for fish fry? Dinner is served 4-9 pm. Choose between all-you-can-eat cod (deep fried or broiled) or a plated perch platter. Both come with potato pancakes, corn fritters, french fries, apple sauce, and coleslaw. The all-you-can-eat fish fry is $12.95 for fried fish or $13.95 for broiled. Served 4:30-9 pm; early bird discount if seated before 5:30 pm. Select Rainbow Trout or Cod – baked or battered & fried. Fish fry is served with your choice of homemade potato pancakes with apple sauce or french fries, creamy cabbage slaw, freshly baked rye bread, tartar sauce, and sliced lemons. Fish fry is just $15. Fish fry is served every Wednesday & Friday from 4-9 pm. 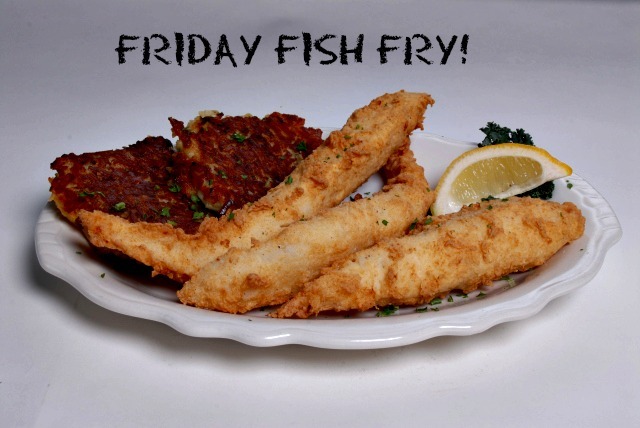 Friday fish fry (fried OR broiled) is served with potato pancakes or french fries, coleslaw, and applesauce – $11.25/adult, $8.25/children Add the relish bar for an additional $4.35. open 11:30 am – 11:00 pm. Enjoy the famous “all you can eat” Wisconsin tradition each Friday. Fish fry is just $12.95/adults or $6.95/children. Friday Fish Fry begins at 11 am. The fish fry is “all you can eat” – with soup and salad included, for just $9! Dinner service begins at 4:30 pm, served Wednesdays & Fridays. 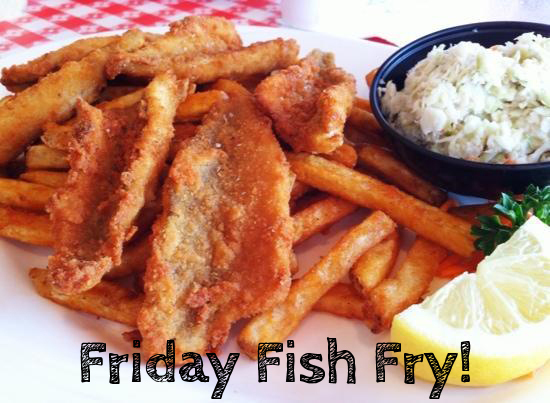 This week’s Fish Fry Friday takes us to another four great locations in Walworth County – Lake Lawn (Delavan), Pier 290 (Williams Bay), Popeye’s on Lake Geneva (Lake Geneva), and Sperino’s (Elkhorn). Join us at one of these local restaurants for a great fish fry tonight! The Lookout Bar & Eatery offers a Wisconsin Fish Fry Basket (8 oz), with breaded fresh cod, french fries, fresh slaw, tartar sauce, lemon & a rye roll with Wisconsin butter – all for $13. You can also get the Wisconsin Shrimp Basket (8 oz), with beer-battered shrimp, french fries, fresh slaw, cocktail sauce, lemon & a rye roll with Wisconsin butter – all for $14. The Frontier Restaurant features a Friday Night Seafood Feast buffet, with Chef’s Catch of the Day, Jambalaya, Golden Breaded Gulf Shrimp, Breaded Cod, plus traditional salads and sides. The Seafood Feast is $23.95 for adults, $9.95 for children 4-12, and children 3 and under are complimentary. The fish fry includes fresh lake perch, spicy slaw, rye bread, apple sauce, and tartar sauce – ALL fresh homemade! All day Friday, enjoy an all-you-can-eat premium cod served broiled or hand-dipped and frid to order…served with homemade potato pancakes or seasoned fried – plus coleslaw and applesauce available upon request. Enjoy all-you-can-eat broasted or baked cod, mostaccoli, potato choice, Sperino’s garlic bread, coleslaw, tartar sauce, and lemon. The carry-out special features 3 pieces of cod, mostaccoli, potato, coleslaw, & Sperino’s garlic bread. Every Friday; 11:00 am – 10:00 pm for carry out and delivery and 4:00 pm – 10:00 pm for dine in. This week’s Fish Fry Friday takes us to four great locations in Walworth County – Fitzgerald’s Genoa Junction (Genoa City), Gordy’s Boat House (Fontana), Grand Cafe @ Grand Geneva (Lake Geneva), and Lakeview Grille @ Geneva Ridge (Lake Geneva). See below for the scoop on these four great fish frys! What does your fish boil include & what’s the cost? The Fish Boil features all-you-can-eat North Atlantic Cod boiled in traditional outdoor kettles on a wood burning fire. The cod is completely free of skin and bones. Served with drawn butter. Combinations including honey-BBQ chicken and BBQ pork ribs with a legendary secret whiskey-based sauce. Other accompaniments include award-winning coleslaw and fresh rye bread, sweet red potatoes and onions which are boiled in the pots with the fish. The Fish Boil is served every Friday, 5 – 9 pm. What does your fish fry include? They offer Wisconsin fish fry and a perch special every Friday. They offer a Prime Rib & Seafood Buffet on Fridays. All-you-care-to-eat baked or fried cod, coleslaw, and applesauce with your choice of potato pancakes or French fries. Friday Fish Fry is served from 11 am – 9 pm. For more great local restaurants in the Lake Geneva area, visit our website. Why not make it a whole evening – or weekend? Check out our Events Calendar for the happenings this weekend, all in one convenient location! See you next week for the next Fish Fry Friday! I hope everyone is having a “good” Good Friday! It’s hard to believe Easter is this Sunday, especially with the crazy weather we’ve had this week. We have had six great weeks of fish fries throughout Walworth County! Comment below – Which local fish fry is YOUR favorite? Thanks for following along this Lent for our Fish Fry Fridays! Check back here for other dining specials, fun things to do, and new events! Hope everyone is enjoying the warmer weather this week – it finally feels like spring! Join us every week this Lent as we feature local restaurants in a mini-series on our blog called “Fish Fry Fridays.” Walworth County is full of great places to eat – some you’ve heard of and some you haven’t! If you have a place you’d like us to feature, comment below or give us a call at (262) 728-6000. For all the previous weeks, click the links for Week 1, Week 2, Week 3, Week 4, and Week 5. Our 6th week of Lent is taking us to FOUR great restaurants – Gordy’s Boat House & Bar, Snug Harbor, Skip’s, and Ye Olde Hotel Bar & Restaurant, all with something unique to offer. 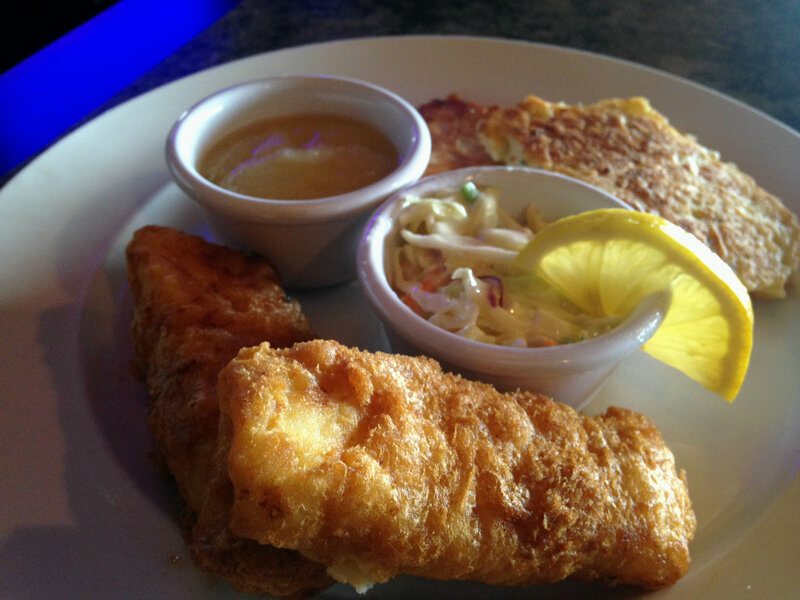 We have broiled or fried cod – comes with rye bread, tartar sauce, apple sauce, and coleslaw. All you can eat – for $11.95! What makes your restaurant different? Prices start at $10.95 per person, depending on fish choice. We offer walleye, cod, tilapia, and shrimp. All come with potato pancakes, baked potato, or french fries – plus cole slaw and rye bread. 11 am – 8 pm; all day every day for the fish fry! The large combo fish plate is $12.95. We offer many different fish – haddock, poor man’s lobster, baby walleye, smelt, blue gill, cod, lake perch. The fish fry comes with a hush puppy, cole slaw, and choice of potatoes. We also have a $10.95 Fish Fry available – smelt, poor man’s lobster, or haddock. Lake perch is $12.95; Walleye Pike is $12.95. Happy April everyone! Easter is still a few weeks away, but we have so many great restaurants left to tell you about! Plus, there’s all those fantastic fish fries we already covered throughout the county…click the links for Week 1, Week 2, Week 3, and Week 4. This week, we are sticking to Lake Geneva eateries: Sprecher’s Restaurant & Pub, Geneva Ridge’s Lakeview Grille, and Popeye’s on Lake Geneva. 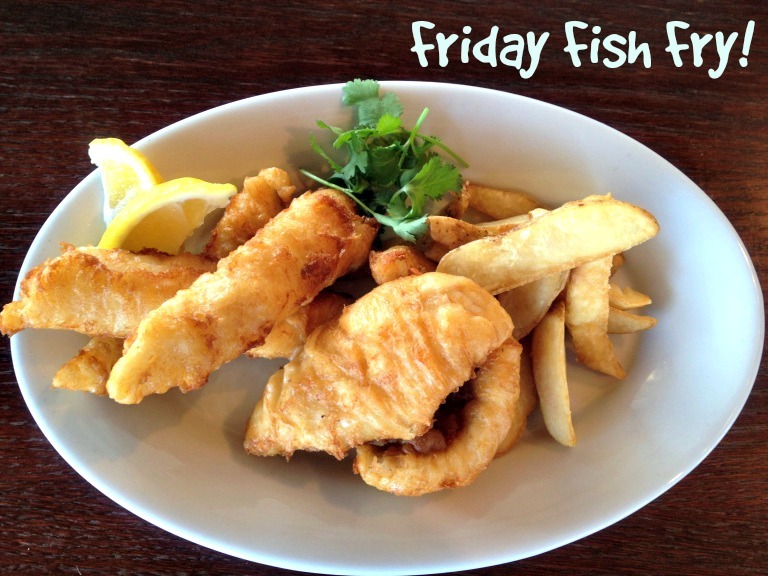 All three offer great fish fries…read more about them below! The fish entree is available every day. Our fish fry is $14.95 – all you can eat! We offer baked or fried cod. Includes coleslaw, applesauce, potato pancakes, and tartar sauce. We have an all-you-can-eat hand breaded fish fry (cod) that comes with seasoned fries or housemade potato pancakes, applesauce, coleslaw, and crunchy rolls…only $12.99 per person. Our cod comes fried, broiled, or combination of the two for the same price. The meal is served family style.